Motorcycle & Small Engine Maintenance And Repair. 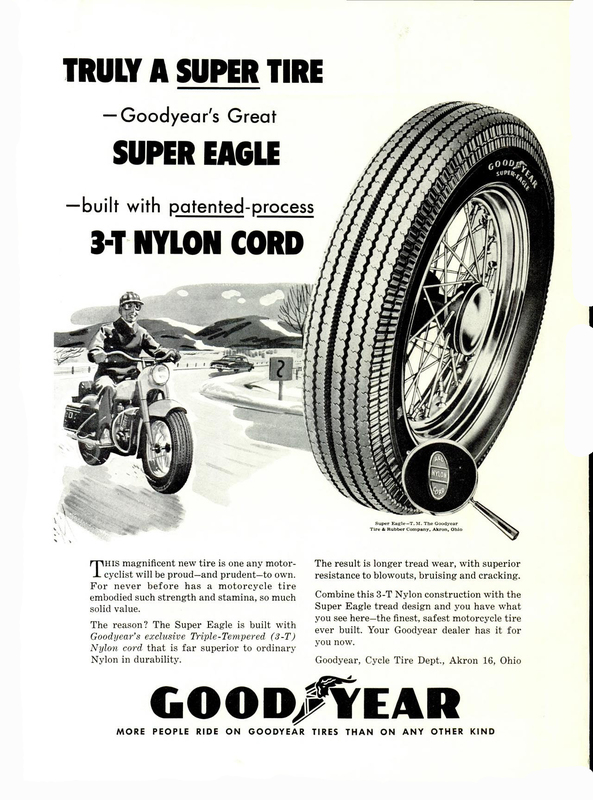 A 1955 Goodyear Super Eagle tire, A Truly SUPER Tire! Have you ever noticed how some older motorcycle tires almost look like they belong on car wheels? I think its the tread pattern, but also like the tire in this advertisement, the tires main contact area looks flatter than a modern motorcycle tire. Almost as flat as a car or truck tire. I remember being in a car parked in a drug store parking lot as a kid and looking at this big street motorcycle parked next to me. The only thing I remember is the motorcycle was a Japanese inline 4 cylinder and the stupid tread pattern on the rear tire. Every time I see a motorcycle tire with a car like tread pattern it reminds me of that motorcycle parked next to me as a kid.